Great birthday card for a coffee lover! Oh I love this. Looks like me at my desk. I forget to take my cups down when I go to get a new cup of coffee. Pretty soon there are four cups on my desk! Oh that blue!!! LOVE that blue...love the scallops, love the balloon. I love the colors on this adorable card! Nothing better than coffee & Newton! That looks like my desk, coffee cup wise! Beautiful card and adorable little coffee drinker to go with :). Your card looks fabulous and is the purr-fect card to celebrate a birthday! Your coloring on the kitty is fab! Oh my your coloring is amazing! Love your card! Oh that funny Newton! A really cute card. Your coloring is amazing. FAB! I LOVE THE BRIGHT BLUE! Great job! Lovely card! The cup with the paw print is darling. And what lovely shades of blue. I love these gorgeous shades of blue! Newton never looked better! Love The blues in your card! Kitty is cute too! Such a striking card! The blue and black are wonderful and I love how you arranged all the coffee cups. 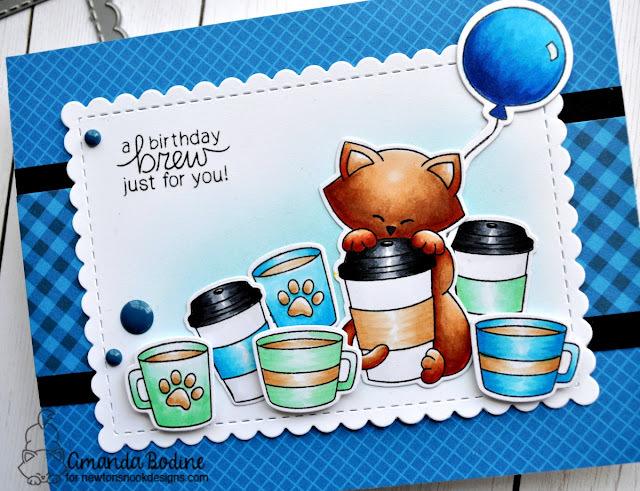 Love your coffee card and all the blue! Aww - this is so sweet!! So cute. I like all the blue. I love the blue! So cute! Just love your card. Thanks for sharing. Adorable card! I love all the layers! And your coloring and color choices are fantastic! Oohh my goodness what a wonderfull catd with Newton and all thise cups. I really like the whole look of your card. I am normally not a super big cat lover, but in the case of Newton I make great exception. Any cat as cute as Newton who loves coffee as much as I do is my friend for life. LOVE your sweet card, and that fabulous frame die you used. Just SO sweet! I love your coloring - beautiful, vibrant colors! Adorable coloring. Thanks for the birthday card in my fave color, the 29th was actually my birthday! sigh, I just love your coloring. This is pretty spectacular! SO awesome! Beautiful and looks like the perfect birthday party! Wow! Awesome card!!! Love your background!!! Well, I'm afraid Newton will be a little nervous with all this coffee ! LOL ! Awesome card, I love the colors. I love this. So much coffee!! The blue background sure makes it pop. 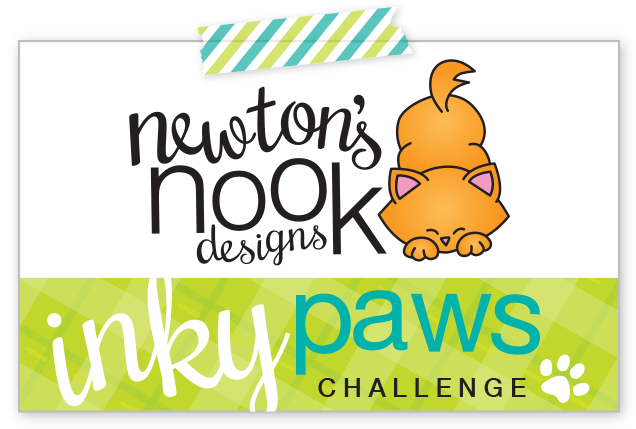 Thanks for the chance to win as I would love to add some Newton to my stamp collection. Adorable card!! I love that stamp set! Darling! Great coloring and I love the blue and green! This card is amazing! Love your vibrant coloring and fun design! Love the bright pop of blue! Lovely card, thanks for the inspiration! Wow!Blue daydream! What an amazing card! Fabulous card!! Your coloring is awesome!! I love the blue!! This is gorgeous! 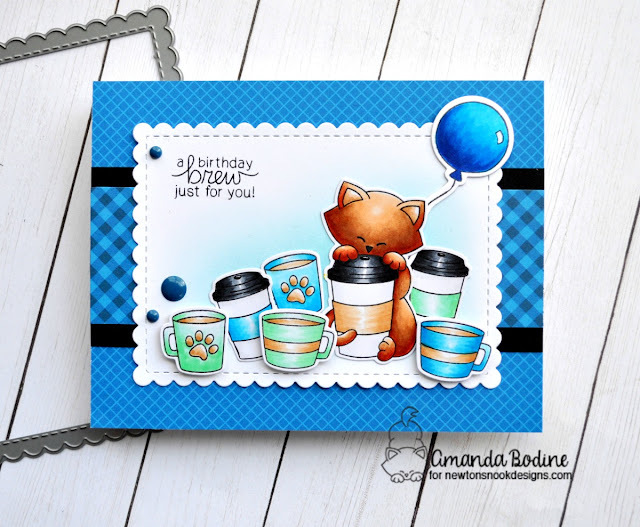 I love the colors you used and the added balloon makes it perfect for a birthday card too!